Each August brings about a fresh, new school year for children across the country. School supply lists are checked off and new shoes, clothing, and backpacks are purchased in preparation of a studious academic year ahead. However, not every household is in enough financial security to provide these annual back-to-school necessities. Fortunately, SCP can help with school supplies for low-income families in Scottsdale. Each year Scottsdale Community Partners and the Vista del Camino Community Center, in conjunction with local organizations such as the Scottsdale Charros and the Police Officers of Scottsdale Association, have been able to provide over 1,000 children help with school supplies. Called “Covering the Bases” due to the nature of supplying Scottsdale children with meeting their basic needs for back-to-school and led by the Scottsdale Charros, a volunteering baseball organization in Scottsdale since 1961, this popular annual back-to-school event is held at the Scottsdale Stadium in July. Other than school supplies and shoes, items such as books, food, dental screenings and well-child exams are provided. For families in need of assistance with giving their children the tools needed to do well in school both academically and socially, Covering the Bases gives more than just pencils and backpacks, it gives confidence and support when it is needed most. According to the 2010 census, about 8% of Scottsdale’s residents live below the poverty line. Help with school supplies for low income families in Scottsdale can be given when meeting the requirements of no more than an income of $3925 a month for a family of four. 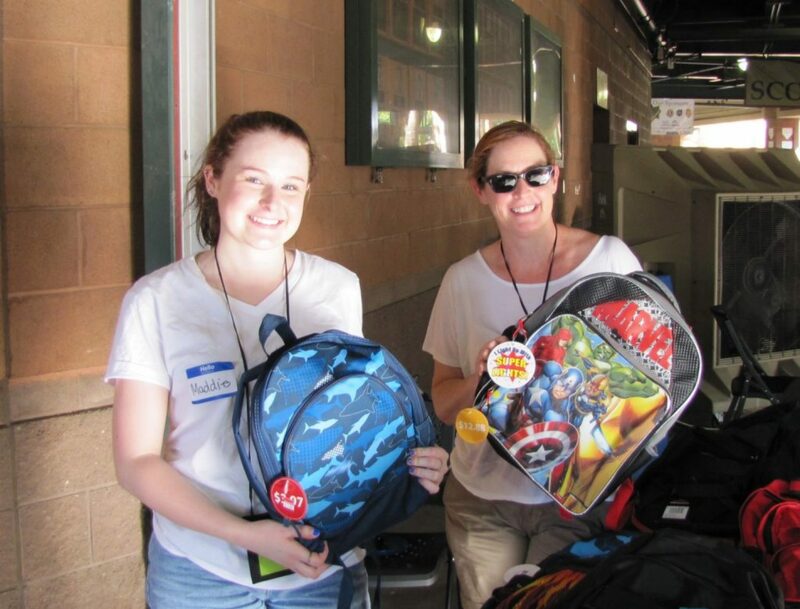 Last year’s Covering the Bases event supplied 445 low-income Scottsdale families with 990 backpacks filled with school supplies, sock, shoes, and underwear to students in preparation for the new school year. The Back-to-School program grows larger each year, as word travels about the services and supplies we are fortunate to supply during the event. View our annual Back-to-School infographic for more details about our Covering the Bases Back-to-School event including the services and supplies handed out and the impact our generous donors and volunteers have given in support of this life-changing program.